Would you like to get up close and personal with an ex- racehorse, or any horse? Would you like have your picture taken with your favorite horse, feed him or her carrots or horse cookies, see how they live and play and find out about their needs? 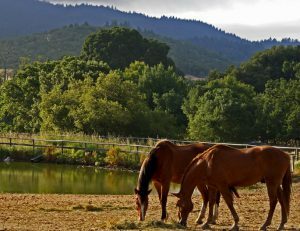 Well, plan a trip to visit Glen Ellen Farms, the home of GEVA, inc. Meet “The Gang” of retired and rehabilitating horses. It’s a day you won’t forget! We’re nestled amidst the vineyards of the Valley of the Moon in the Sonoma wine country. We don’t have grapes – just horses. But we do offer a glass of wine or other beverage during your visit, and a couple of hours of fun. Call to make an appointment (707) 527-8092. Take home great memories and pictures (don’t forget to bring your camera).